My mom routinely picked up the wrong can and we had creamed corn. No one ate it. She would try to sneak it in casseroles but we always knew. We were like cats picking out the vegetables in the kibble. Sneak it off the side of the plate where she couldn’t see it until we were out of range. We teased her about it. Often. Annoyingly often. She would get so annoyed with herself. She’d look at the product, then glance away (look squirrel!) and pick up the wrong can. That was humorous until this gene surfaced in me. Wop! I bought facial tissues with lotion instead of plain. In the humongous bundle from the warehouse store. Yikes! I took them back. I’ve written before that we buy paper towels by the pallet (that’s just a slight exaggeration, it’s more like a tractor-trailer load). Always at the warehouse store. In bundles claiming to be the equivalent of 87 gazillion normal rolls. (What is a normal roll anyway?) Only the pick-a-size rolls too. In white! We use it for food prep and don’t want pictures of puppies or kitties on our vegetables or chops. Once we picked up a pack of the full size sheets (it was like an apocalypse! We were waiting for lightning to strike!). We saved those for the beloved husband to use in his workshop. He uses full size there. And the cat litter room for the occasional “clean up in aisle 3” situation. We had enough for a long time. Last week we hit the bottom. I blame it on the beloved husband (secretly though because he’s normally perfect). We opened the first roll of the ginormous mega roll pallet and this is what we saw. This took me right back to the “olden days” when teapots and daisies were popular. I was surprised they still make patterns. Who decorates their home with paper towels? (Will it clash with the granite top or curtains?) These are my favorite colors but I wouldn’t want to see it in my mashed potatoes. Or tattooed on my steak between the grill marks. Since we split open the package, we will use them in the laundry room, workshop, cat litter room and any other place that needs a little decoration to brighten it up. Always a silver lining! We are both on high alert now but I doubt that will stop us from picking up the wrong product again! Let’s hope it’s chocolate. This entry was posted in Aging Gracefully, Humor, Life at Home and tagged groceries', home decor, paper towels, picking up the wrong stuff, printed paper towels, warehouse stores by Kate Crimmins. Bookmark the permalink. The creamed corn gene (sometimes known as the paper towel gene) kicks in as we grow older for a sound evolutionary reason: to make us experiment and explore new things. But Kate, I’m not sure I should follow you any more. I mean, milk chocolate? Yechhhh. It’s worse. I prefer Hershey’s to the primo brands! “Do I have it” or “do I need it” is always a guessing game when I forget to make a list and check items. This morning I had to go out to buy molasses because I didn’t write it on my list for yesterday’s shopping. I always guess wrong. This did remind me of my mother’s paper towels too. And her old wallpaper! My wife bought tissue with lotion last week. I pointed out to her that neither of us have colds. She just looked back at me; to her all tissues are the same. I just shake my head! They are not so bad unless you use them to clean things. Then you get a smudge. Some packages are not well marked. You definitely have to look for it but I saw my brand now identifies both either non-lotion or with lotion. Haha, they definitely have so many options to buy! I didn’t know they had decorative ones! In my head I wonder what went kaflooey! How easy is it to pick up white pick-a-size paper towels? I haven’t seen patterned paper towels in AGES. I never saw the point of them, but what they are far less offensive to me than patterned or coloured toilet paper. That’s just wrong, wrong, wrong! I hadn’t seen them either but then again, I never really looked. I can’t remember the last time I saw colored toilet paper. Maybe the 90s? … and that’s a good thing that it’s relegated to the distant past. I have never had creamed corn! I’m not exactly sure how they make it but it looks like mashed regular corn. I didn’t like the texture of eating by itself. Put into cornbread and it’s great. Actually, they lost me at “Disney Frozen”! Holy cow! I really thought this was a one off but they still do make them! Star Wars? Yup, I have to have white paper towels too, and the half-sheets. Must be Bounty as well. I’m a purist – the other paper towels don’t absorb as well and you can read the newspaper through some of them. I use canned vegetables … my favorite is canned niblets corn and I used to buy one or two cans of creamed corn per year just for variety … that is until nearly two years ago when I opened the can, put my spoon in for a big spoonful of creamed corn before spooning it into the saucepan. After downing some, guess what I found in the can? OMG! You took me there! I will always look before I eat. We mostly eat frozen vegetables but I’m sure things get in there too. I know frozen vegetable are better for you nutritionally, but I have had three instances in the last five years where we had a power outage and I lost all my fridge/freezer food, so I try not to stock up on a lot of refrigerated food anymore. I did do a big shopping for fridge/freezer food today, only because I don’t want to get caught in the Thanksgiving crowd and it was horribly busy. I told my boss I’d be back the regular time, maybe 15 minutes late and I was over an hour late getting back. I had no work to do and often work late without being paid, so I went this morning to beat the weekend crowd. I was told that no humans touched the corn, so that was why no one saw it. Little consolation to me after I had a big spoonful of it. I’m not a big creamed corn fan either, but thought it’d be something different. In a saucepan I may not have seen it either, even though it was large. Ugh. It’s early for Thanksgiving crowds! I don’t think the nutritional difference is much. We use canned tomatoes and beans all the time. It’s just the corn, peas and when I’m lazy, broccoli that I get frozen. I’m not a peas person and my mom would get mad at me when I was young for pushing them around on my plate. I only get the frozen broccoli as I worry so much about the listeria issues. They had an article on the news this morning that recommended everyone in Michigan get a Hep A vaccination now as the outbreak is so bad – since I don’t go out to eat nor buy fresh veggies anymore, I’ll hold off a little longer but 900 cases in Michigan this year alone. So scary. I hate it when brands don’t make their variations very distinct on the packaging because I’m forever doing this. I used to do it all the time my favorite frozen food meal – thai spring rolls. They also made southwest spring rolls and garlic chicken. All the packing looked exactly the same except for the name. All next to each other. I wasn’t the only one, the grocery stockers often put the wrong box in the wrong place which made my inattention worse. The worst was if I grabbed the garlic chicken – it was inedible. That’s a helluva way to solve a problem! Who decorates their home with paper towels? Ha. So true. We use a lot of them, too and always buy the white. Either these were leftovers from the 70s or people do decorate with prints. There’s an army of us! John and I both made mistakes with Greek yogurt, so we read the label aloud now as one of us puts it in the cart. That doesn’t keep us from picking up other things that are wrong. John prefers BIG paper towels, and I like the half-size option. It’s time for me to sneak off and get the ones I like. I love the way your posts spark lots of discussion. Paper towels are a very serious topic. It’s a lot like toilet paper! Over or under. You are spot on. I didn’t realize how serious paper towels were. LOVE the PTs. Hah sorry. I like plain everything. Sheets too. Sheets and towels. If you spill some of the more potent skin care products on them, they will spot or stain. Nope! I did buy a beautiful flannel plaid set for the bed last year but after the fluff wore off it was stiff. It’s in the donate pile now and I went back to my cream colored knitted sheets. I never use prints or striped for the bathroom towels (except maybe the powder room). There’s enough clutter. Well, if nothing else Love is a good message to see every day. So do they clash with your granite countertop? We need to know. They are already in the laundry room and out of the kitchen. Since they were tucked deep under a cabinet, they didn’t have too much design impact. In the laundry room, they are lovely! You always hit on the issues in my own home! Like buying the wrong things. That can happen easier now than ever since there are so many ridiculous “other” choices in whatever aisle you are standing in front of. I just bought “large” dog treats because they looked like the tiny ones on the box. They were called “macro” and I missed seeing the “large” label so I got a BIG box. Bill comes home with printed paper towells – my pet peeve too. I don’t need any more patterns to add to kitchen clutter. I want a BARE kitchen. As for canned veggies, I still serve such atrocities and Bill absolutely loves (Yuk) canned peas. Creamed corn is great in corn bread! YUM! Kate, you are not alone in picking up the wrong product by mistake! My theory is that they move a different product in with the one I wanted and I was fooled. No printed paper towels for me either or tissues with lotion and have tissue holders for most that I use. Then I am even picky about what design I buy. OK, I will try to focus more when I shop! Sometimes another customer puts something back on the wrong shelf too. These errors usually happen when I’m in a hurry although not always. Sometimes I’m just clueless. They were hiding with the white paper towels at the warehouse store. Probably found them from 1970. I don’t like tissues with lotion either. Crazy that something like paper towels would make such a good blog post 🙂 Nice writing, Kate. There was a lot of teeth gnashing here when we saw what we bought. It was purchased a few weeks ago so there so no hope of exchange. If you use a tissue to clean anything the lotion will “schmutz” it up! I was super excited to find the square boxes of tissues in winter/ holiday designs at Costco last weekend. My husband laughed at me because he says we will be using them through next summer, but I don’t care. I buy those but not in the big packs. I like a little holiday spirit. I have several tissue holders but not on my desk. Right now I have a lovely sailboat tissue box there. 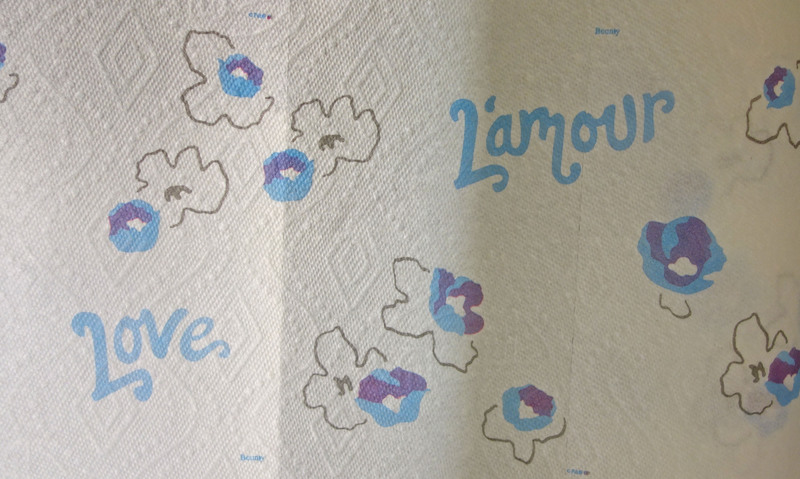 LOL at decorating with paper towels ~> the good old days. I like plain white choose-a-size. And plain white tissues. Remember when toilet paper came in colors? OMG! My husband eats a piece of dark chocolate every day for “health” reasons. He doesn’t like it but he eats it like I would take cod liver oil. My thinking is that if you get it in the milk chocolate variety you get most of the benefits and you actually like it. I’ll put you on my list for wayward dark chocolates. Yes! And milk chocolates gets them little guys doing the happy dance! Boy, my head’s been in the sand. Since we only eyeball and buy generic/cheap stuff, I didn’t even know they still made paper towels with patterns. Hunh, how ’bout that? Heehee, maybe I should look for a Christmas pattern for the upcoming holidays! It’s not something I thought about either. We just always pick up the same stuff at the store but somehow this time we didn’t. Maybe little snowmen for Christmas? Loo rolls and kitchen rolls, my forte Kate as you know! We’ve tried cheaper kitchen rolls, and you just have to show it the tap let alone get it wet for it to disintegrate in your hand. I stick to Plenty…… plain white, fat rolls that are super absorbent and at present 6 for just under a fiver compared to £3.50 for 2, three if they’re on a three for the price of two offer. Hubby is usually the one to pick up the wrong thing, but I try not to let on. He picked up the wrong yoghurt (for himself) and didn’t notice until he’d opened it and commented on how thick and creamy it was. Oops. I got caught with the low fat mayo, going by the colour of the lid, purple for the lighter than light, only to discover I was in a different shop, and the one I wanted had a green lid, so I took it back to change it without a problem. Sneaky, manufacturers always trying to catch you out (and sometimes winning). Nice kitchen roll by the way. Happy and loving thoughts as you wipe sotospeak. During the summer I had picked up cheese for homemade pizzas. I looked at the mozzarella but picked up the cheddar instead. Nothing wrong with cheddar but it’s not pizza cheese at least to me. It was on sale so I bought 4 packs! I had to find creative ways to use it. We like cheese but I never buy cheddar. I use a mature cheddar in my cooking, be in lasagne or Mc Cheese. We don’t eat that much, though occasionally we go have cravings for cheese and crackers, so I just buy the one type. Wish I could have sent it to you. The last of it went bad. We prefer Swiss or Mozzarella or some of the other types. Thank you for the thought. Could you have frozen it? Probably but we were tired of eating something we didn’t like. I should have given it to someone else sooner. Most people like cheddar. It was already shredded. Ah, I buy it by the lump. Usually I do too but this was for pizza. LOL! Perhaps you should consult your cats about the Paper towels, you never know they may like pretty things. 🙂 Wasn’t it Mollie that wants to be a model, models always want pretty things around them! Funny story to start my day! Thanks! This one was fun to write! You know…idiot thing to do makes great story! I’ll admit to buying the decorative paper towels around the holidays, but they must be choose-a-size. I didn’t even know they made such a thing! I look for holiday tissue boxes (even though I have a gazillion in a closet) but this was a shock. I hate dark chocolate too. If you can get milk chocolate why would you eat the dark stuff? Just because someone says it’s healthier? In our grocery store they even do themed paper towels – lemon for summer, etc. We just buy the cheap stuff without designs. I don’t need themed paper towels either. I didn’t know they existed. Many years ago there was a big “stink.” Some woman complained to the newspaper that she put her homemade periogies on paper towels. The ink was on her food. I kinda thought they stopped designs then. Hopefully it’s food safe colors.